Ethnic violence in Myanmar between Buddhists and Rohingya Muslims could have dangerous implications for the entire region. Ethnic violence in Myanmar, a country recently known for its reforms, has re-emerged in past few days in its Rakhine province bordering Bangladesh. This is perhaps one of the few ethnic conflicts in which people practising religions of Buddhism and Islam have come to direct confrontation over a range of issues including livelihood, status and identity. Myanmar is a majority Buddhist country in which about 90 percent of the population practice Buddhism, while only about 4 percent of the population practise Islam. The geographic proximity of the country to Bangladesh, an Islamic majority country, has further complicated the issue as most the Muslims in Rakhine state are of Bengal origin. The recent spate of violence has witnessed death of about a dozen in revenge killings and torching of hundreds of houses, reportedly of the Buddhists by the Muslims, who were an earlier target of Buddhist violence. The state responses have so far been meek. The Myanmar leadership appeals for peace and order, and the state has imposed emergency law in the region. The President of Myanmar, Thein Sein, appealed the people, “If we put racial and religious issues at the forefront, if we put the never-ending hatred, desire for revenge and anarchic actions at the forefront, and if we continue to retaliate and terrorise and kill each other, there is a danger that the troubles could multiply and move beyond Rakhine.” However, unless the crucial issue of alienation is addressed, the problem will likely continue and may become more violent. Bangladesh so far has maintained silence, mainly owing to two reasons. It does not own up the Rohingya Muslims in Rakhine as its own people, and secondly, as recent developments suggest it has rather adopted an active policy of maintaining a distance from the affairs in the Myanmar’s state. It stopped giving refugee status to Rohingya Muslims since 1992. Reports suggest that two boatloads of people on their way to Bangladesh from Rakhine recently were stopped and returned back by Bangladesh’s sea guards. The Rohingya Muslims, numbered at about 800,000, are not recognized as state citizens in Myanmar, despite some of them residing in the country since generations. As being stateless people, they are deprived of many opportunities generated by the state. This gap between the minority Muslims and the majority Buddhists, in terms of status as well as livelihood, becomes a major bone of contention, and has also further led to alienation of these people not only from the state but also its majority Buddhist population. The issue received major international attention in 2009, in which five boatloads of people were stranded in sea, as they were blocked by Thai authorities. Some of these people died of drowning as well as starvation, thus leading to international uproar over the issue. Unless the basic issue of alienation of Rohingya Muslims is addressed, the state machinery will likely be unable to address the pent up frustration in the region. More so, the emerging image of Myanmar as a reformist state, with release of leaders like Aung San Suu Kyi, and launch of democratic reforms may get a dent from the recent developments. President Thein Sein expressed apprehension that “the country’s stability and peace, democratisation process and development, which are only in transition right now, could be severely affected and much would be lost.” The strategic location of Myanmar and its emerging prospects as a gate way to the Asia-Pacific, and as a major energy hub, and the recent ethnic violence pushes the country into brink of instability with wider implications. The port of Sittwe, the capital of Rakhine – the centre of current ethnic violence, has gained increasing importance in recent months. China is investing in this port, thus the prospects of its emergence as an emerging transportation hub has appeared bright. This port is not far from Indian island archipelago of the Andamans; hence the strategic importance of the region cannot be segregated from its current politics and regional dynamics and also the regional leaders’ approach to various issues including conflicts. The countries surrounding the region too are prone to ethnic conflicts. Besides Bangladesh and Thailand, the two major countries India and China bordering Myanmar too have witnessed ethno-religious conflicts in recent past. India in its north and north east, and China in its north east have witnessed violent ethnic conflicts and loss of lives and properties in recent years. Hence, all these states will naturally prefer a peaceful solution of the conflict in Rakhine, and in that venture they may extend their support to the Myanmar leadership to address the issue. At present, these countries perceive these developments as internal matter of Myanmar. However, none of the political leaders in the country have come out in open and advocated measures to address the issue of alienation in a reconciliatory manner. Reportedly, the United Nations while appealing for peace has relocated 44 out of its 150 officials from the Rakhine province. The present spate of violence ensued in late-May when a Buddhist woman was raped and murdered allegedly by three Muslims. 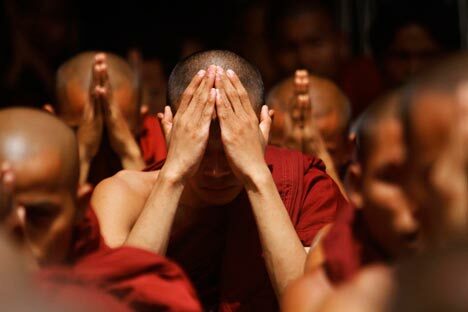 In the process of revenge killing, the Buddhists lynched ten Muslims on 3 June 2012. The violence spiralled up and engulfed the towns of Maungdaw and Buthidaung, resulting in death of about a dozen people. Reportedly, the Rohingya Muslims torched hundreds of houses of Rakhine Buddhists. The government imposed emergency on June 8, 2012, and sent armed forces to the state to rein in violence. The law prohibits congregation of more than five people, and remains in force from morning till evening. Despite appeal from national and international leaders for peace and harmony, the state of uncertainty and fear still prevails. The current Rakhine situation is akin to a tinderbox, ready to erupt and grapple the whole region with impacts across the borders. The fear of international networks of terrorism and fundamentalism taking advantage of this fragile situation in Myanmar may not be ruled out. Organizations like Al Qaeda will savour this fragile situation as a fertile ground to further their objectives. Dr Debidatta Aurobinda Mahapatra is associated with Centre for South and Central Asian Studies, Central University of Punjab, India.